It was around 3 A.M.
Max was 2 years old. He was in his crib sleeping and I wasn’t about to disturb him. Paul was 4 months old. He was finally asleep in his crib. I wasn’t. I was up, standing in the kitchen starring at the linoleum floor. The room was only lit from the moon, yet I was wide, wide awake. I wasn’t happy to be awake. It made me nervous. I wanted desperately to snuggle my mind and body in somewhere to rest both. But it wasn’t going to happen. I was broken. This mama was indeed broken. My mind and body were both shattering into pieces that I couldn’t put back together like a child’s floor puzzle. During the day, my eyes could barely stay open. My feet felt like they were stuck in maple syrup as I walked around the house moving from highchair to nursing chair to the clothes that were on a chair to be folded. So, so many chairs. Where was my energy? Where was the feeling like I wanted to get ready and go out into the world and have a great day? When was I coming back? When was I going to be put together again? Answering these questions took time and a commitment to seeking help. My rambunctious, smiling babies helped me make it through the day. They were thriving despite my feeble efforts at keeping up with them. Max made Paul laugh, giggle and screech with delight everytime he walked in the room. He was constantly hugging and softly kissing him. “Baby Paul” was just content being with me, nursing and playing along side me. Thank goodness Max also wanted to spend most of his time outside. He made sure I saw the sun and got fresh air. After the night that I was up starring at that kitchen floor in the moonlight, that morning felt heavy and insurmountable. I couldn’t carry it that day. Or another one. I needed help. It was then, as I watched Ben put on his scrubs for work. Thank God he could depend upon someone else washing his clothes. He was pulling call night after call night working hard to complete his residency in Pediatrics. We were both tired, but one of us couldn’t bare the thought of the day. I felt guilty that it was me. I was broken. My spirit had been snapped in half and I didn’t know what to do. He gently closed the door. Thankfully, he wasn’t on the other side of it. He started making phone calls for appointments and I was sent to bed. I didn’t argue or disagree. I was very, very thankful. Postpartum depression feels contradictory. You have a beautiful bundle to be so happy about holding and your mind is fogged up in a haze that is difficult to navigate. The restlessness and anxiety that can sometimes accompany it are also contradictory. You’re not tired when you should be and exhausted when you should be awake. It all feels wrong and unsettling. You feel crazy. You feel ashamed of how you feel about your life. You feel broken and unfixable. My experience with postpartum depression, it turns out, is not unusual. But I was lucky. My husband was willing and able to help. He held me accountable for staying healthy. I had a few friends that were willing to dredge through it with me. Therapy and medication work. They work very, very well. It’s important to know that they work even better when they are implemented together. 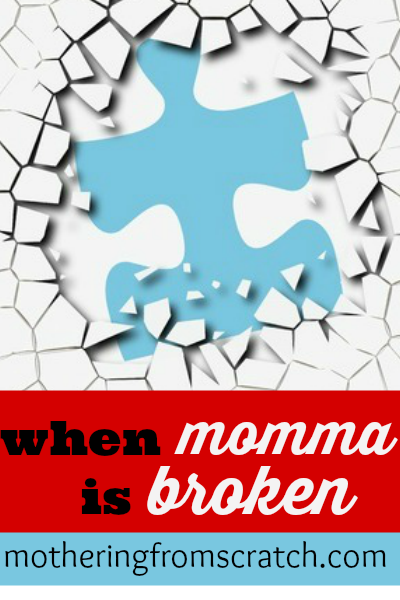 So, how do you fix a broken mama? Piece by beautiful piece. Day by day. God doesn’t want us to suffer. This is not a test of one’s faith or strength. It’s a test of one’s obedience to the truth of recognizing a medical condition that can be treated. We would never assume that a mother’s battle with any other acute or chronic illness would be a test of either one. Depression (postpartum or not) is not either. Moms need help. We need people to recognize that we need help, too. We need compassion and tenderness when we feel broken. In order to regain strength and resilience we also need patience, with ourselves and from our loved ones. Are you in the middle of postpartum depression? If you’ve had it in the past, how did you get through it? What would you say to a mom who is suffering right now in silence? « ready to put some new life in your mothering?